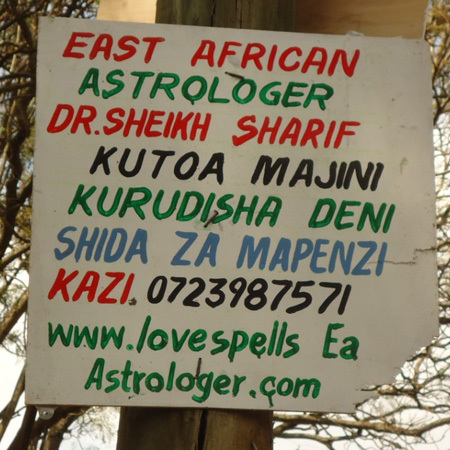 I do not know the number of Kenyans who consult Dr. Sheikh Sharif and his ilk, but by common sense I can deduce that it is a hell lot of people. The mushrooming of posters like the one above across the country is a direct indication that many unemployed Kenyans have discovered a virgin but ripe market segment, an indication that so many Kenyans are out seeking help from witches for personal heartaches caused by a beautiful lady’s refusal to yield to poorly arranged pickup lines, help to salvage businesses that respond to poorly executed business strategies, and help on serious health issues that the poor and/or expensive nature of our health facilities cannot address. My intro suggests that only the poor and those just above poverty line who live in Eastlands and below are the ones who find solace in witches. Far from it. In February 2013, Dennis Okari exposed how politicians consult witchdoctors in the run up to elections, general or otherwise. According to the witchdoctors interviewed, politicians all the way from Presidential candidates to MCAs seek their help to win elections. The investigative piece by Okari can be viewed in the two clips below. Reliance on astrology, witchdoctors and religion for solutions on health, business success, marriages and relationships, economy, and general development and prosperity is the highest level of ignorance humanity has ever been in since the beginning of time. As time has progressed, solutions to the problems faced in the mentioned facets of life have been founded on sound principles of science and technology. As an example, hundreds of years ago, exorcising demons to get rid of leprosy was a given, but medical advancement has put a stop to that act so today you can get rid of leprosy simply by taking “dapsone and rifampicin for 6 months” and get well. Writing in his Sunday column on November 29 2014, columnist Philip Ochieng linked civilization to science and technology. Arguing against sticking to ancient traditions in the name of shielding ourselves from Western influence, Ochieng had this to say, “Negritude (a worldwide black intellectual movement) used to urge black societies to return to the extreme inadequacies of thought and technique of their ancestors. They have persistently urged black people to disembark from the only known vehicle of human development — namely, science and technology — and return to Stone-Age bliss called ‘African culture'”. It is science and technology, not snakes, dragons, frogs, and dogs; not the moon, the sun and the stars; not even the deities, that will effectively address and curtail the problems we must live with on this earth. If frogs, dogs and gods could save us from diseases, famine, drought and floods, we could be in utopia by now. The developed world did not progress to become first world nations through miracles, prayers and fasting. The uncivilized Kenyan (he or she that doesn’t take science and technology seriously) has created a fertile ground for witchdoctors and quack witchdoctors to lick them like leeches. If these Kenyans do not find themselves visiting the astrologers in the dead of the night, they get themselves in a midst of a religious fake in hope that a miracle to double, triple or quadruple their earnings will happen; that they will save themselves from inevitable death, or even receive cure for their sons and daughters, some of whom end up dying in the process. That’s sickening. What’s more sickening is to watch well educated Kenyans in a TV show lift up their technology gadgets and money in belief that words uttered by the likes Prophet Doctor Kanyari to multiply their earning will come to pass. The saddest part is that some of those in attendance will go back and re-strategize on their income sources, become successful, and attribute the success to Kanyari, to thereafter give their 310 panda mbengu offering to the con. Why do you blame Churchil? Many Kenyans are outraged that Churchil hosted Dr. Kanyari in his Churchil Show. To quote Angela Angwenyi of Nation FM, “such lunatic cannot be accorded that airtime”. Really? Warn the neighbours, put the children to bed, get your tea ready because ‘Prophet Dr’ Victor Kanyari is LIVE on #theTrend at 10pm on NTV Kenya. Finally! Kenyans reacted in excitement to the invite. Kenyans waited, but Kanyari didn’t show up. 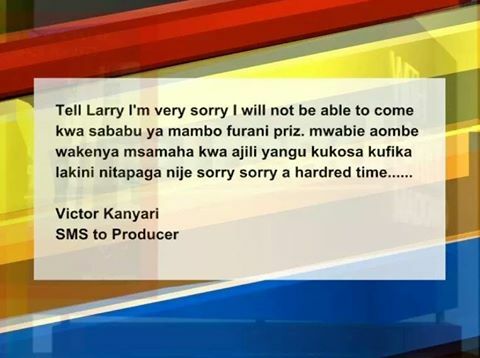 His SMS apology was posted, a post that went viral. My question to Kenyans is, would it have been cool for Larry Madowo to host Kanyari on #theTrend but not Churchil? Surely? Someone once commented that Kenyans have a memory of a chicken, now I know what he meant.